What is death? What happens when we die? Why would this matter? Death might sound like a gloomy subject to think about, but the fact is that by contemplating our own mortality we will experience more freedom and happiness. We will have a broader perspective on human existence, and we will value each moment of our lives much more. During this weekend we will explore how we can have some control of the processes involved, and practice the stages of death – through meditation. We´ll learn about the Buddhist approach to this transitional life phase. Discussions, Q&A and teaching will support our meditations. Past courses have proven to be challenging and full of joy! Born in Dundee, Scotland, Mary was a Staff Nurse when she first encountered Buddhism at Foundation for the Preservation of the Mahayana Tradition’s mother monastery -Kopan -in Nepal in 1978. It was her love of adventure and trekking that led her to Kopan. Mary attended a month-long course taught by Lama Yeshe and Lama Zopa who emphasized the importance of meditation and taking complete responsibility for your own actions and their effects. 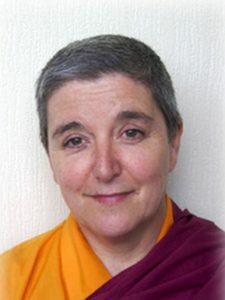 In 2001 Mary took ordination as a nun with Lama Zopa Rinpoche, then taught meditation and Buddhist philosophy at Jamyang Buddhist Centre Leeds, Buddhist centers in Preston, Liverpool, and at Armley Prison, Dumfries Prison, Leeds General Infirmary, St. James’ Hospital and Wheatfields Hospice, where she held regular meditation sessions until 2012. Over the years Venerable Mary Reavey has undertaken and led many meditation retreats. She completed a one-year solitary retreat in 2014 and another three-month retreat in 2015. She continues to regularly teach at Jamyang Buddhist Centre Leeds, Jamyang Liverpool and in York. Ven Mary has recently moved to Jedburgh in order to live nearer to the Land of Joy Retreat Centre where she regularly leads retreats.